We know how uneasy it is for you to wait for the DU LLB 2018 result. But students must keep patience as the declaration of the results is around the corner. Yes, the results are expected to announce on the official website soon. The result of DU LLB 2018 declared online. Also, students are able to check the result in the offline mode on the Notice Board of the Admission Committee. Delhi University (DU) has declared DU LLB result on the official website on July 11, 2018. Result for DU LLB entrance exam has been declared in the PDF format and also DU LLB entrance exam result is declared in such a way that aspirants can find their DU LLB roll numbers and names in DU LLB result sheet 2018. Candidates who have appeared for the 3 years DU LLB 2018 exam can get their result from their registered accounts. DU LLB result 2018 sheet also includes an aspirant’s All India Rank (AIR) and Category Rank (CR). Candidates can stay with us to know all the important updates about DU LLB 2018 Result and more. 1)How will you get to see your result? Visit the official website of Faculty of Law, University of Delhi law faculty.du.ac.in. A Pdf page containing, registration number, roll number, name, gender, category, full marks, marks obtained and rank displayed. Firstly, The DU LLB 2018 Results declared will be on the basis of the cut-off list. DU LLB Cut off will depend on the number of candidates applying for the Examination. DU LLB Merit list issued by the Delhi University. Candidate can check their name on the DU LLB Merit list. 3)What next after the results are announced? Finally, The result declared in the third week of July 2018. The candidates called on the basis of the merit list for the counselling. The applicants scored marks, which are above the cutoff, are eligible for the admission procedure in the DU LLB and after that counselling procedure starts. The DU LLB authority releases result for different courses provided by the university. The Result of DU LLB announced by Delhi University (DU). Delhi University conducts the DU LLB 2018 Entrance Exam the for admissions to various LLB courses in different colleges affiliated to the University of Delhi. Although, The DU LLB exam is wholly conducted by the central admission committee of the University of Delhi for those candidates who are seeking admissions into various law course. DU LLB Entrance exam 2018 attracts talents seeking admissions in LLB and LLM courses. The Instructions, Rules, and regulations are decided by the Delhi University and in compliance with the relevant Government orders in place. Straightaway, candidates can check here all the necessary details of DU LLB Entrance Exam 2018 such as exam dates, application form, eligibility criteria, syllabus, exam pattern & Results, etc. 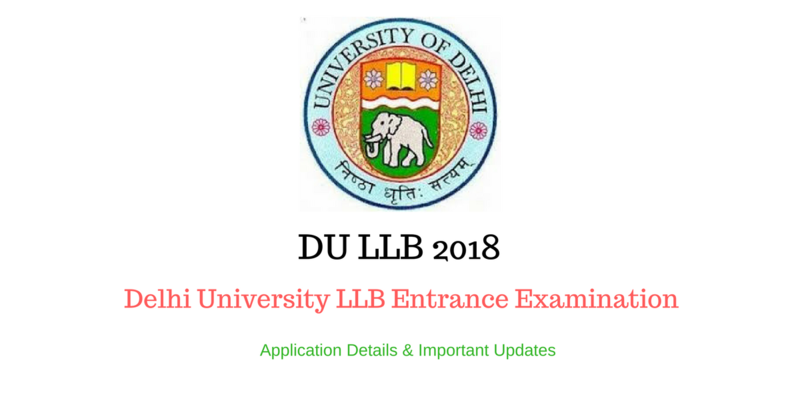 Aspirants who are willing to attend exam can find below the important dates of DU LLB for latest events and updates about DU LLB results over the Delhi University Law Examination. Refer the DU LLB Exam Calendar below for events and their corresponding dates. The mentioned dates are tentative and for reference purpose only. The official dates are yet to be announced. Firstly, the Counselling session will starts after the results are out. Candidates whose score is more than the DU LLB 2018 cutoff, according to the merit list of DU LLB 2018 the counselling of DU LLB 2018 take place. Faculty of Law, Delhi University organizes the DU LLB Counselling. Also, The counselling conducted via offline mode. Although, All the candidates assigned a centre for the counselling process and candidates to have to report to their respective centre and on the given date by the authorities of DU LLB. Candidates will also have to present a list of official documents for verification and xerox copies of the same for submission. Particularly, Aspirants should ensure they submit only the correct information at the time of DU LLB Counselling process as used for their seat verification. DU LLB counselling 2018 is to be the last step towards admissions into the three-year law programme. Although, after the successful tests and verification, the candidate can appear for the admission in the DU LLB. It is important for the candidate to be present physically for the counselling and if the candidates fail to be present on the day of the counselling than the candidate’s seat cancelled. Nowadays as provided by the online option the candidate can choose and fill their preferences of colleges and courses online on the official website of DU LLB. Since the list released for the candidates who get selected for the admission procedure.